Wow Bale with more pace than Ronaldo. That's new. Bale is faster than Ronaldo imo. Bale with better passing than Messi and Suarez. 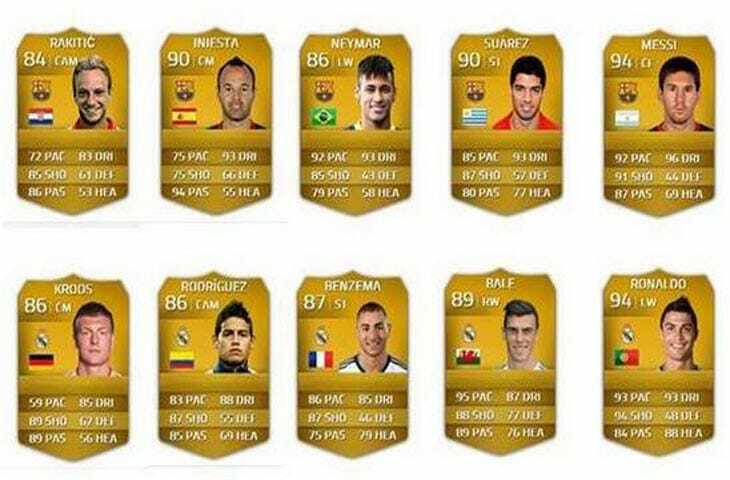 Dempsey and Messi will be on the cover of the North American version of the game, according to EA. Dat new shirt pulling animation! Just realised those game developers have to suffer all those slide tackles when making the animations. Nah that's just the quality of the image imo. FIFA 15 won't include Brazilian domestic teams, EA Sports has confirmed. Changes to the way players are licensed in those leagues means the likes of Pato, Kaka and Ronaldinho may not make the cut, though players who are part of teams in other leagues and the Brazilian national team have apparently made the cut. "Today, we want to inform you that due to some changes in the ways players are licensed in Brazil domestic leagues, we were unable to reach an agreement with the Brazilian rights holders for their inclusion in FIFA 15," EA said in a statement. "While this is unfortunate news for many of our fans, we were able to retain the Brazil National Team in FIFA 15 as well as the Brazilian stars that play in other top leagues around the world. Thanks for your understanding as we continue to keep the lines of communication open with the Brazilian rights holders." FIFA 14 included 19 Brazilian teams, including Palmeiras, Santos, São Paulo and Vasco da Gama. For now though, it looks like if your favourite is only available in the South American country's league you won't be able to play them come September unless they transfer beforehand. Because PES has the rights to it, saw it announced the other day. But you have Bundesliga and PL so you can't complain too much. A biting feature either in FIFA or PES. All 20 Barclays Premier League stadiums now feature in FIFA 15, up from eight stadiums in FIFA 14. The FIFA team’s exclusive access to Premier League clubs allowed detailed photography of all 20 stadiums so they could be authentically recreated in FIFA 15. The cheers, chants and sounds of more than 20 Premier League matches were also recorded. FIFA 15 will have realistic audio to goal reactions, misses, whistles and over two hours of crowd-specific songs.